Once you look through the artist’s work, please give him some feedback here. Phenomenal paintings!!! AWESOME!!! Thats what our warriors are supposed to look like!!! Seeing these paintings was inspirational. You have a real talent thats given by waheguru himself. Please keep up the good work and I look forward to purchasing these beautiful pieces of art. God bless. I just saw your excellent work and I foresee a great artist in you. I am a novice artist myself and your paintings have definitely inspired me to pick up my pencil and sketch a few concepts myself…wish you success in your endeavors bro…keep the paintings coming! I would love to watch more of them…. Amazing stuff. You should have some free desktop wallpaper downloads, even pencils…will spread your art more. weapon=khappra teers(arrows)with six finger width,heavy bow 6 tanka means 9000kg, heavy dhall,heavy khanda etc. i suggest u to listen or read the granth . daily khatha is being done at gurudwara dukhniwaran sahib patiala. reply me at mail add. Sikhs dont celebrate “DIWALI” so why have a special sale for the occasion? You work is unreal. What medium do you usually use? My recent work is digital but I am familair with watercolours, acrylics, oils, pencils, charcoals, etc. Your painting are just amazing and beautiful. Just by looking at them, I feel so proud to be a Sikh. Thank you, so much for the paintings and keep up the good work. its about time people start seeing what our people did in the past for our culture and religion. sometimes pictures say more then words. really good work, i look forward to seeing more. ultimate paintings , i have not seen paintings of this quality till now , its really too too wonderful and it also defines what we r………amazing bhagat bhaji….. Very beautiful and incourging paintings, keep it up !!!!!. It really shows who we are. Wonderful work. Paintings look brilliant and keep up the great work. By the way, this is your buddy from back in Tagore Public School. Take care keep in touch. khalsa ji ur paintings are phenomenon its very nice to see such new art in our religion. may god bless u with his pleasures and u may contunue doing such creative things can u tell me which country are u from..??? i would really like to meet u..
Im in India and amazed to see this art work. Can someone reply to my email above and tell if it’s possible to buy online with the full graphic version being emailed to m so I can get it printed in India. mindblowing paintings brother!!! I would like to ask Mr. Bhagat what is the size of Shahibzada Ajit Singh painting on canvas? I am interested in buying, please e-mail me thank you. These pictures actually made our warriors alive which shows their ‘MASSIVE’ personality which speaks itself that how great they were. Shri Guru Gobind Singh Sihib Ji has ridiculously blessed The painter Bhagat Singh.i wish him good luck that god give him more skills to DRAW more pictures to keep us informative about our religion. These are beautiful! Thats a serious God given tallent! Keep up the excellent work. Wow! Amazing paintings, well worth the money. Please do keep making these and if I can afford then soon I want to buy a few! Amazing work penji/veerji keep it up! This is true art and it makes me very, very proud. Bole sohnihal SAAT SRI AKAAAL!!! You made some amazing artwork here. No doubt- all excellent. But all images are showing anguish, war, fights. Could you make some with love and peace in it? Waheguru Ji Ka Khalsa, Waheguru Ji Ki Fateh!! Paji your work is AMAZING!! i looked at your work and was lost for words….keep up the wicked seva…brilliant way of spreading Sikhi. Waheguru Ji Ka Khalsa, Waheguru Ji Ki FAteh!!!!! Hi, your artwork is amazing! I doing A2 Art & my work is about images of conflict & I really want to look at your work for inspiration as I want to look at conflict in sikhie & punjabi culture. It would be great if you could get back to me so i could ask some questions. I just wanted to let you know that your paintings are phenomenal. I absolutely love them. If I had a million dollars, I would open up a Sikh museum and dedicate an entire hallway to your magnificent works of art! tuhada hunnar dekh ke bahut hi khushi hoyee iss toh jyada khushi iss gal di hai ke aaj v sade dil vich apna mahan sikh itehass bass reha hai. waheguru ji di bahut kirpa hai tuhade te jo ohna enna hunnar baksheya tuhanu! Ardass karde hain uss akalpurkh aage ke tuhada eh hunnar apni sikh komm nu usdia jaada naal banni rakhega!! The Work you have done is awesome………!!! Great piece of work ! Must say that the emotions shown in the pictures are awesome, one can sense it ! Really liked your work, keep it up ! Very inspiring art my brother. My favourite is the one of Ajit Singh in battle … very very inspiring. Great realism and imagination in every painting. Excellent attention to detail. Thanks for sharing! great work, hope to see some more in the future. tusi ta kamal he kar diti a. sikh ithas diyan mahan hastyan diyan tasviran tusi bahut he vadia banayan ne. plz chotay sahibzadyan de koi tasvir banao . 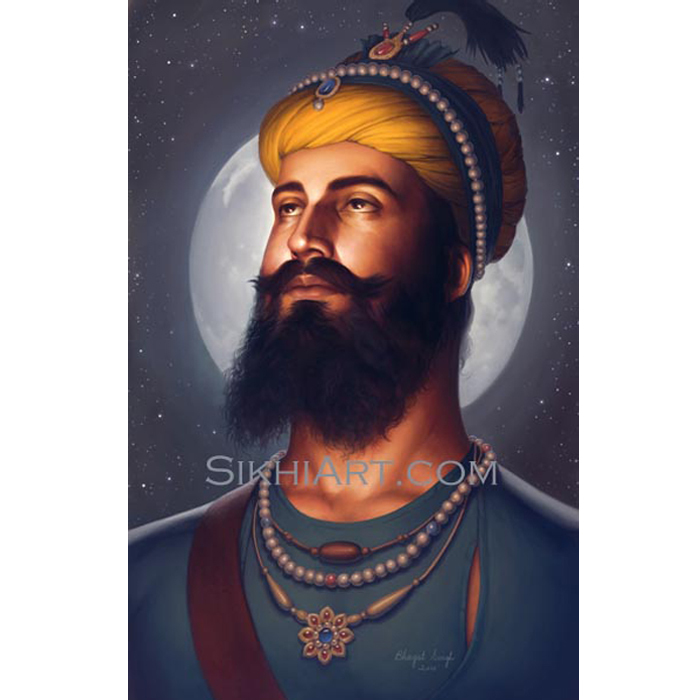 Can’t stop staring at Guru Gobind Singh’s pic, find it so relaxing yet intense, overwhelming bro, keep up the good work !! Really awsome work. Chardi kalaa keep it up!!! Waheguru ji ka khalsa Waheguru ji ki fateh jio…..
SSA JI………AWESOME WORK………….BADI SONIYAN PAINTINGS HEN………….THEY LOOK LIKE REAL ……….KEEP DOING IT………. Very good work …… i i appreciate u r work . I don’t know who s the person behind this incredible job ..!!!! bt who so ever is doing this is a wonderful job …..!!!!! may god bless that man and may waheguru fulfils all his desires and wishes …. !!!!! u have given a huge gift to sikhism .,!!!!!!!!!! But i would like to see images of guru ji with noor on their face not with the anger. I hope you will develop the images soon. Really looking forward to it. Vahe Guru Ji Ka Khalsa Wahe Guru Ji Ki Fateh. ! Thank you! my heart and soul were moved by the Guru Gobind Singh painting you did, there is so much in it, every time I see it, i catch my breath! It would be amazing to see paintings with the light of SGGS enveloping our world today! May you soul continue to shine trough this medium! paintings are very nice………no words to express feelings…..
Wow, this was the first word it came to my mind when I saw these paintings. The expressions, emotions shown are par excellence. Shows reality of the paintings, unlike the others which looks like artificial. Some of the battles scenes of Chamkaur di gaddee, Baba Deep singh were like the movie 300, excellent. May almighty gives you more and more ideas to express you gratitude towards Sikhi. Chardikala. well done sir !!! god bless ! i hv a query wat color medium u r using and for a correct portrait to come out on canvas wat remains ur sourse of inspiration? For me, Sikh history and the values is a huge source of inspiration! More inspiration comes from art, Sikh art, movies, songs, video games and shabads amongst other things. THIS IS VARY GOOD EFFORT TO INCOURSE OF SIKHI .I FEEL PROUD BE A SIKH.KEEP IT UP. nice i really appreciate ur effort great paitings! waheguru jika khalsa waheguru ji ki fateh. 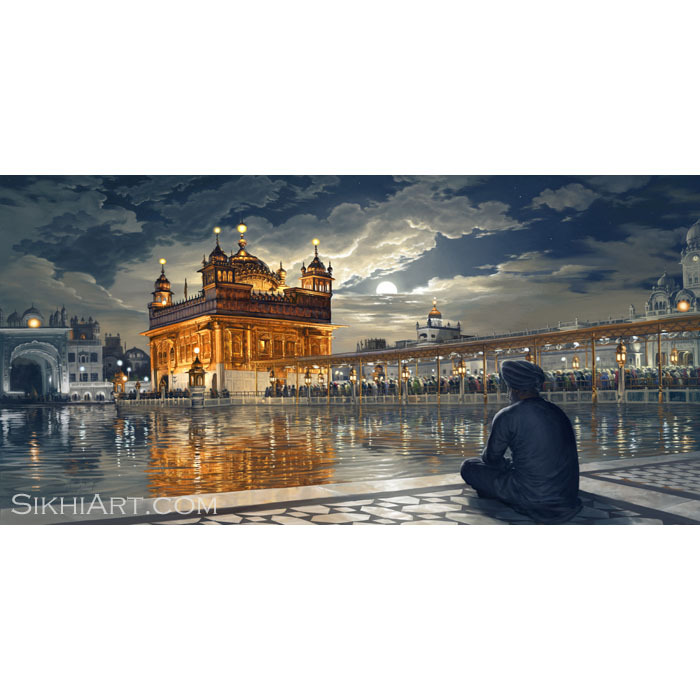 mere jis veer na ah painting kati hai waheguru uss nu chardi kaala which rakhe. this is the fantastic work, everyone who lover of sikh history & sikhi,,,,,,,,, he blessing u my friend. 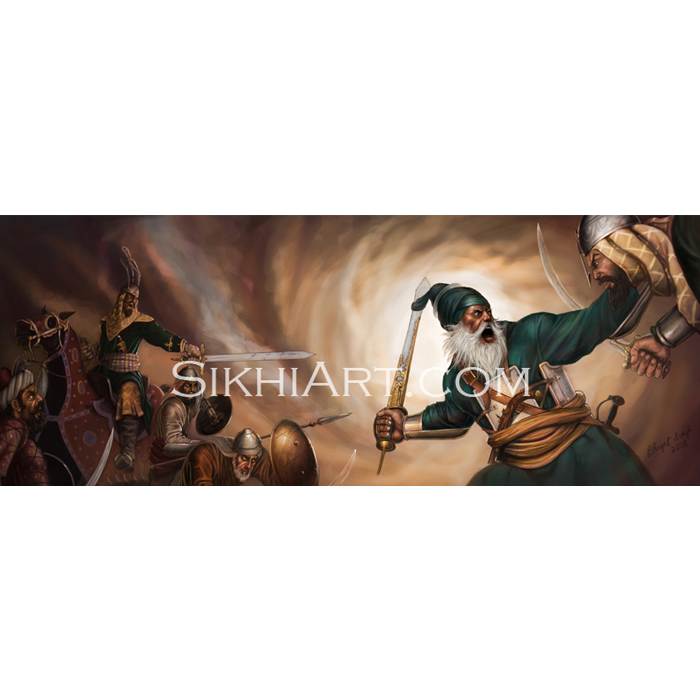 This is incredible..Sikh history as it is so inspirational..and you guys become catalysts..
Great art! It is really nice to see such paintings that the young generation can connect with. For a very long time, we have all got used the standard paintings found all over various gurudwaras etc. These paintings are really great and very different from the routine paintings. Keep up the good work. Waheguru bless! you paint the art of sikhism which is a good deed. this type of art can change someone life. paintings dekh ke ta inj mehssos hona shuru ho janda….jive rooh us time wich e pahunch gayi hundi ha…. These things are really what we need today to uplift our religion……..
Today it is not the era where we should only talk and give lectures,but it is the time when we all should use our talent to make people aware what SIKHISM is all about.I have no words to express your talent…….m speechless. And it makes me feel proud that I am a part of a religion where people are exceptionally great……..proud to be a SIKH!!!!!!!!!!!!!!!!! 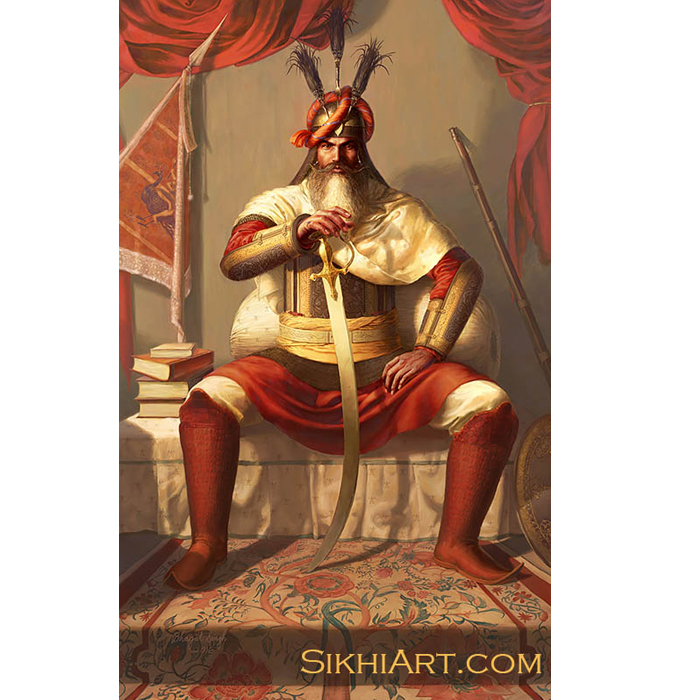 Almost your work is fantastic mostly on Sikh Warriors, Kindly try to diversify your work…. You have amazing painting skills and a great gift by Waheguru’s grace! Really creative and inspiring work. I am not an artist or painter or anything but one question if I may, why some paintings show dark fury scenes? I would enjoy more lighter somber scenes and also a sketch with a Punjabi/Indian village life during Guru Sahib’s times would bring Sikh history even more alive. I also admire your hard work in putting this piece of art and it shows the love you have for Guru Ji and Sikhi. Peace and Happiness with His blessings to you! SSA Bai g today i feel so proud by visiting ur site that i don’t have any words to say. when ever i switch on internet i always found some well furnished Sikh website and maximum times i search for sikh paintings which i never found even on google. I really so admired that it’s my first time i have ever sent my feedback to anyone ,but today i can’t restrict my self to share my views with u . As im also from IT field also thinks that some day i will launch my on website that is based on sikh religion & culture ,but because of some resources i never do so. Last But not the least i want to congratulate u for ur step keep it up………. i was just wondering since you made a painting of Sahibzada Baba Ajit Singh Ji if you have the time you can maybe make a painting of Sahibzada Baba Jujhar Singh Ji??? You are a fabulous painter.I appreciate ur work.Painting of baba Deep Singh ji is mind blowing.kepp it up. Verji dat was mindblowing……..Gr8 job ….but i hve a reqst .tusi plz baba Deep Singh ji & Maharaja Ranjit singh ji di kuch paintngs ho sake tan plzz upload kar do… I wnt to see dat……..
u have done a simply fabulous thing to attract youth towards sikhi…….. Mind blowing painting, keep it on Guru chardi kala vich rakhe tuhanu, your work is AMAZING!! i looked at your work and was lost for words….brilliant way of spreading Sikhi. These are beautiful! Thats a God given tallent. I really appreciate your work. really a great work on sikhism. mere pyare veer ji tuhadian banaian paintings dekhian. maharaj di bari kirpa hai tuhade te jehra tuhanu do khaas bakshishan kitian. ik tuhanu hunar ditta jo tuhadian banaian paintings cho saaf jhalakda hai te doosra tuhanu sojhi bakhshi k is hunar di varton sikhi de parchaar vaste la sakon. main jinian v paintings dikhian ne oh sikhan di ate guru sahib dian jung related hun;jad ki sikhi de hor v pehlu ne jiven bhagti, balidan,samaj sudharak etc. tusi ehna te v kamm kar sakde ho. baki eh bahut vadia uprala hai tuhada. wahe guru ji ka khalsa wahe guru ji ki fateh. its amazing this is very good effert to incourse of sikhi. Very Good Work done Over Here..
sat sri akaal veer ji.your work on paintings is mind blowing and i appritiate it.i have no words for praising your work and imagination.outstanding,keep it on. Amazing stuff , Excellent effort…!!! We all Sikhs are in debt for whatever u’ve done / are doing for our community…..!!! WAHEGURU HAMESHAAN TUHAADE TE AAPNNA MEHAR BHAAREA HAATH RAAKHE…….!!!! Excellant job! Artist is truely bleesed with art!keep up your work! Veer g! Waheguru ji ka Khalsa, Waheguru ji ki Fateh g!!!!!! I just cecked some of ur stuff in ur gallery, Its really awesome!!!!!!!! These faces, expressions are really valuable. Waheguru Ji Ka Khalsa Waheguru Ji Ki Fateh! Amazing stuff. I love it, keep it up the good work! these are the most amazing work i have ever witnessed in my life . we have lots of expectations from bhagat singh . hi theer!!!!! ur gud in art ……. Waheguru ji ka khalsa, waheguru ji ki Fateh!!!!!! Some absolutely incredible work here. We are in serious need of good artists who can represent sikh history via paintings – you are definitely one of our best talents. You seem to put great thought into your paintings and make them very life-like. Keep up the good work as you are bringing alot of enjoyment to fellow sikhs. Whatever you do don’t detract from this line of work – god made you for painting that is where your legacy lies. We shouldn’t expect this for free so I am looking to buy a painting & I encourage anyone who looks at this site to buy at least one painting so as to ensure you get bigger and better. Waheguru ji ka Kalsa Waheguru ji Fatehe ,Akaal Purakh di mehar hai ji tuhadi team te jo Sache Patshah tuhato Appni vadiyae aene vadia kam nal karva rahe hain. Dear Son,wahe guru ji ka khalsa wahe guru ji ki fateh you are doing amazing job, while seeing the movie 300 my self and my son gurleen are talking about the great Bette of Chamkaur di gari it is the only Bette were 40 surmes without food and water fighting against lacs of enemy’s. were as 300 solder of spata fighting to save their land but kalgidhar patsah were fighting to save humanity and mankind. keep it up someday we will see the series of Sikh history over your site. wahe guru ji ka khalsa wahe guru ji ki fateh. Waheguru ji ka khalsa, waheguru ji ki fateh. tadi art kiti pics nu dekh k te mere akha v athroo aa gaye… aj v sadi ehni dukhant history nu dekh k ehna proud feel hunda k assi ohna de bachhe hain. tusi ta pic ch jaan pa diti ji…. god bless u..n keep it up…. Your paintings are really original in style and simply amazing !!! Any chances of seeing a painting with Shaheed Udham Singh in. but brother, mata bahg kaur’s painting is not sofisticated, its bit on vulgur side. dont take me wrong, but i told u what i got…. hope u will correct me. One of the rarest paintings I have come across, each character has a spark a kind of passion in its eyes. YOU MUST KNOW THIS FACT THAT ALL THE WARRIORS AT TIME OF HOLY DASHAM GURU WERE SEHAJ AND COOL & CALM THEY NOT FOUGHT FOR THE KILLING TSO THEIR EXPRESSION ARE NOT SEEMS TO BE A KHAUFNAK COLOR CONTRAST. THEY WERE BHAGAT, FOLLOWER OF SIKHI. EVEN YOU HAD PAINTED GURU ANNAK DEV JI IN HARD COLORS IN THEY SEEMS BE GENRAL PUBLIC PERSON NOT THE HOLY GURU WHICH SPREADS THE PREM & PEACE. sorry, but honestly, your paintings are more than words can say or write, infact they’re not even like paintings, they are like worlds and reality and if you look in the charcter’s eyes you see much more than emotion. It is more than calm and peaceful yet sincerly above anger, or even fear. Teri pyaas na jaae – my praises are unworthy of your realities and worlds vaaheguru ji ka khaalsa, vaaheguru ji ki fateh. I am no connoisseur of art. But I can say the painting of Shri Guru Nanak simply emanates pure spirituality. An excellent piece of art at par with the paintings of Sobha Singh. 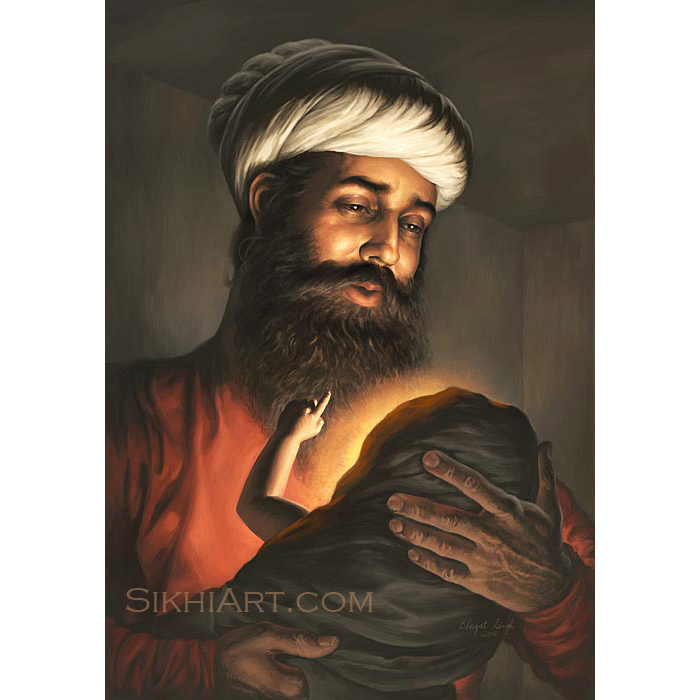 I am a 2nd generation Sikh in the UK and am sometimes dissillusioned by the imagery that Sikh Art conveys. However, your work is really awesome. I realise the style is contemporary and like the art in graphic novels. I was so happy when I saw the picture or Baba Deep Singh Ji, and that you did not depict him in the unnatural image of carrying his own severed head that is usually shown. Similarly, the pictures of Guru Nanak Dev Ji, and Guru Gobind Singh Ji are very real and natural and bring a new and truly inspirational dimension to our Gurus. I am really looking forward to seeing more of your work. Your painting skills are progressing nicely. You still have a lot of growing to do but you are on the right path. I am hoping with all my heart that you continue on improving your skills in lighting and shade. 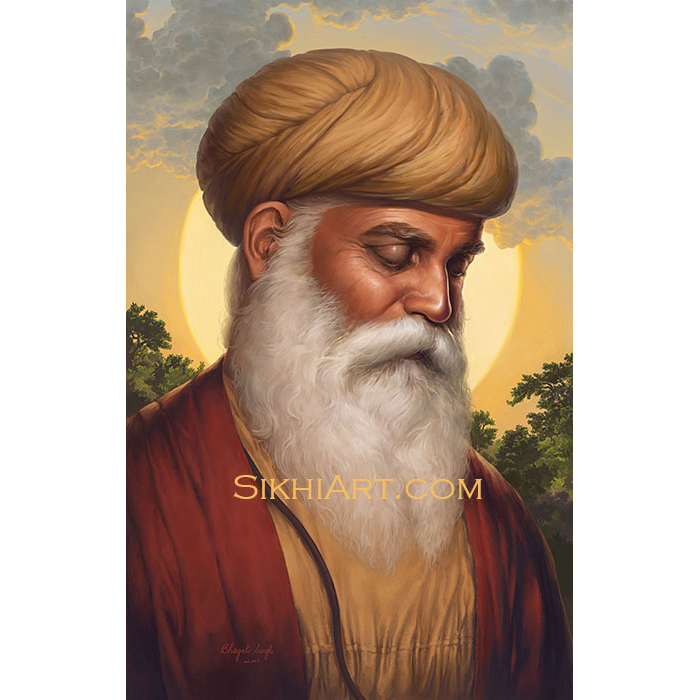 The Guru Nanak Painting is a great improvement in light and shadows. LOOK to the great masters from around the world for guidance. Also you can get the same ferocity across without all the anger but then again that might just be the vigor of your youth coming through. GREAT JOB. KEEP IT UP!!! Happy Vaisakhi! Just stumbled upon your work. Amazing! Speechless. Please keep it up, you have a God-given talent. you are doing a fabulous job…. it should be done for our young youth who are forgetting what is sikhi……. sat shri akal.. bulai parvaan hove..
by da way, I pay specially THX 2 u BRO … 4 dees arts. though being a muslim by religion and pakistani by nationality i still have firm believe that the bravest part of Punjab’s history comes from sikhs, and by the way at same time the core of Guru Nanak’s teaching is peace so please display some paintings about peace too. These pictures are amazing. I love the one of Mata Bhago and Sahibzada Baba Ajit Singh….looks wicked! keep up the good work 🙂 …. Do you think you can do one of Mata Sahib Kaur??? for eg. – its not the gold on the harmandir sahib that we’re struck by rather we feel the energy, the thrum of it, its where innumerable battles have been fought, the history attached to it creates its significance, the bullet marks etc, its an ongoing art project, and art is life, which means art is not necessarily confined to a piece of canvas. i hope my spiel makes sense :), become an artist, you’ll easily get a scholarship! 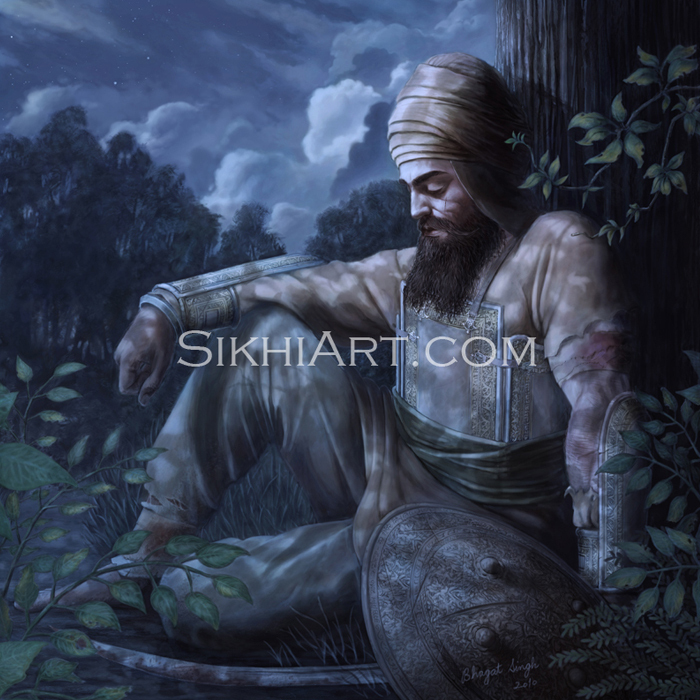 Amazing painter, the ability to bring the past to life, and nothing spread the message of sikhi like a picture. I have only one request, the very light skin of nanak in the most recent picture is not really in context with guru nanak and india. I would like to see Guru Nanak more in saffron, with darker skin tone, richer, and a younger version of Nanak, so that the young generation can relate to Guru Nanak as a younger as many sikhs only see guru nanak as an older man. I love your work, and keep it up. Bhagat Singh, I want to thank you for sharing your talent and love for the Guru with the rest of us. I can only wish you improvement and give blessings. May you continue to produce thoughtful work. Waheguru ji ka khalsa, Waheguru ji ki Fateh!!!!!! Paji I am inspired by your work and have also started painting my art teachers do get a bit scared off what I produce but they love it all I want to say is your a wicked artist keep up the good work and thank you for sharing you art !!! Waheguru Ji Ka Khalsa, Waheguru Ji Ki Fateh. Tuhade hattha which Guru di Kripa hai.Your painting touches the heart. Really excellent works. Sikhs in moods. You are simply amazing i have never seen such accurate detail in historical Sikh art work, you are as good or actually even better than Sobha Singh or any other artist!!! AMAZINGGG if a movie was made with your art work…people all over the world would be attracted to our history..i am speechless. Continue the great work, we need people like you!!! … in todays world people are to lazy to read and learn… you are showing history through paintings, after visualizing things people will want to know abt the stories of our ancestors, martyrs, and Gurus. Btw if u ever have time please make a painting of Nawab Kapur Singh Virk!!! that would be awsome. I m a fan of sikhism nd guru nanak dev. 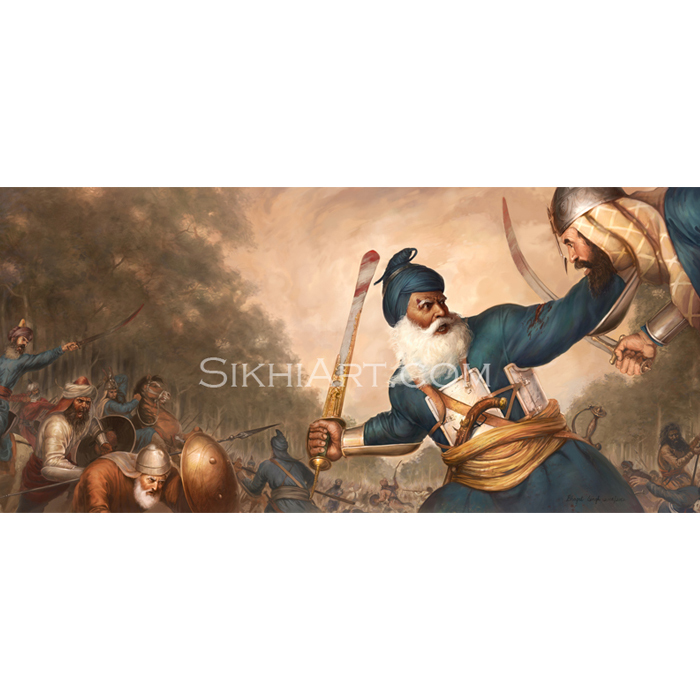 really appreciate the aggression of sikh warriors depicted by you in your paintings. All I can say is WOW! Your work is inspiring, sensational, admiring, astonishing…I could go on forever. You are extremely talented and I am very glad to have found your art work. Every piece is so beautiful! In the future when I am earning, I can see myself buying many of your art pieces. However I’d like to ask, do you sell any of them to the UK? Also may I ask, did you do Art for Gcse’s? I appreciate your compliment(s). Yes I regularly get sales from the Uk. I am not familiar with Gcse. What is it? waheguru ji ka khalsa waheguru ji ki fateh jio. . . . .
Yr bhagat singh you are realy doin gud n awesome job for sikhism i realy do like this site. Just a small request and my opinion, I am sure you will agree with it..
forces with just handfull of sikhs. without a sweat on his forehead. gave the whole community Its identity and a name..
down. He was in the world but above it . I understand and respect your point as an artist to bring out various aspects of Guru’s Life. But he is the supreme Inspiration for the entire Sikh Community. He is the Supreme commander for Sikhs in Army across the world.. Guru Ji was the supreme conqueror of everything. So keeping the above in mind we should not and cant show him tired or dejected or low. I am sure you would agree ..
we all go thru tough and ardous times – it is these times that toughen you up and make you into a stronger and hopefully a better person – to see and feel how the Guru may have felt after his sacrifices is nothing short of inspirational. to see a one dimesional character showing only one facet of his life, only makes our lives the same – one dimensional…………..And we are not one dimensional! We need to feel the Guru’s pain inorder to understand what he went thru and then compare and realise we ride on his name but cannot offer anything like his contribution to mankind. waheguru ji ka khalsa waheguru ji ki fateh your work is very good. there is one thing that in painting of Guru Gobind Singh ji (vasakhi) Guru ji’s dastar is not real. dastar which you have shown is used in Mahaja aera of punjab and style used by Guru Hargobind Sahib. but 10th guru used a new style which is known as “Domala”. we can see this style in Nahang Singhs. this style is the creation of Guru Gobind Singh ji. Yes the turban in that painting is not historically accurate (and his beard would be more grey) but it would not be a Domalla either. The puratan paintings of Guru Gobind Singh ji riding a horse, surrounded by Nihangs, show him with a royal Mughal turban. This is in contrast to the Nihangs around him who are wearing domallas. I have not come across a single painting of Guru Sahib with a domalla. This royal Mughal style of turban was worn by the gurus after Guru Hargobind Sahib ji opted for a turban during the gurgaddi ceremony and it is the only one see in puratan paitnings of Gurus. Your skill is incredible. And I greatly appreciate how you attempted to portray the spirit of Sikhi in your subjects rather than having them decked out in ice cream pink etc like some artists do! I appreciate the kind words. Actually I’ve seen Indian art from that time, some of it is mind-blowing! First I would like to say what amazing paintings you have created of these warriors. I am from Australia and would like to ask if you do custom paintings. And I’m willing to pay for it. Yes I definitely do that. Let’s get in touch via email. Can I get these in India?? Yes you can! Just let me know which ones you want. 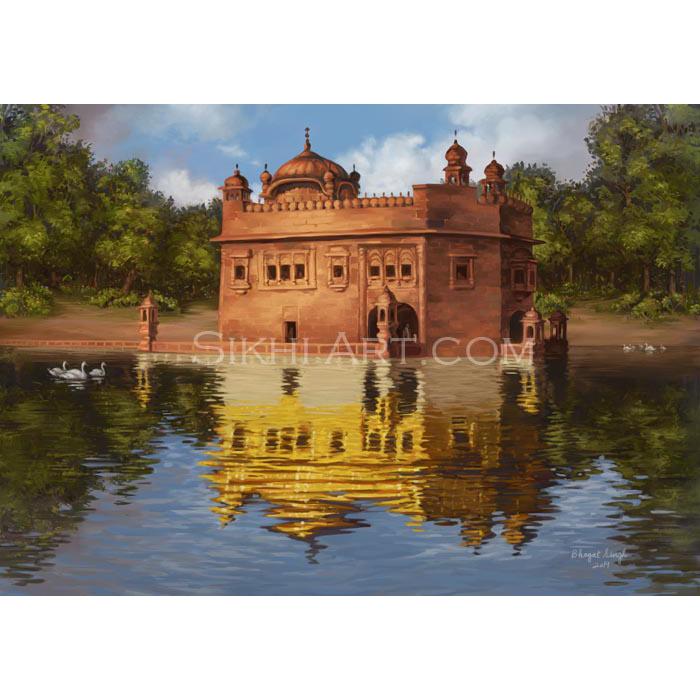 These paintings are a great way to depict our rich Sikh history, they are indeed stunning! I was wondering if you have ever done a painting of just the women, such as Bebe Nanaki, or Mata Sahib Kaur? I am working on a series of 3 paintings and I really like the idea of doing the evolution of women through Sikh history. I would love to see something like that, as I am not a professional. I love your work and can’t wait to share it! Words are less to explain these painting….GREAT WORK JASBIR SINGH… U r truly Blessed. Excellent Job Bhagat Singh j!!!. Keep it up. May Waheguru bless you and your work!!! Not framed as yet but do it soon. Beautiful paintings …… My mom was touched when she saw Guru Arjan devji’s painting. And indeed all the paintings of Guruji’s are divine and serene….very beautiful. Please continue with such brilliant work.But, personally I would love to see some more of Guru Nanak Devji’s paintings. Sikhi Art © 2008-2019. Copyright. All Rights Reserved. Paintings and images may not be reproduced without written permission from the artist.